Why cleanse? It cleans your skin of the pollutants, oil, and other pore clogging toxins that you either release from the inside through perspiration or accumulate from the environment. It is perhaps the simplest beauty technique to keeping your skin vibrant and fresh, and it's takes less than a minute to do. Cleansing is a no brainer for healthy looking skin. But, like any fine recipe for beauty, we must use the finest ingredients if we want to have the greatest effect. That's where organic cleansers come in. Here are two of our best value natural cleansers and all you need is a little water and gentle fingertips to let these lovelies do their job. 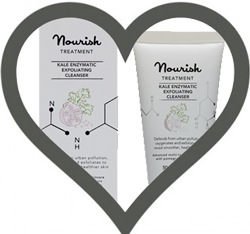 The Cream Cleanser by New Zealand brand Trilogy is one of our most popular products. It contains organic rose hip oil which is an exceptional active ingredient to help with the regeneration process of our skin cells and the repair of damaged tissues. The Green Beauty Bible said that this was one of the best products (of 80 different cleansers) they tested and that it had ‘perfect texture - creamy-rich but not greasy or too thick... skin felt very moisturised'. It comes in a recyclable 200ml pump container that seems to last far longer than most of our other cleansers. The best organic budget buy is the 2 in 1 Cleansing Milk by Lavera Basis. It has been specially formulated for extra sensitive skin so is good to use around the eyes - great for removing eye make up. This vegan cleanser/eye make up remover is certified by Natrue. It contains pure plant oils, and herb extracts including organic jojoba, witch hazel and shea butter. We find that the best way to cleanse is to massage the product into the skin and then remove with a warm, damp Muslin Face Cloth. This will get skin super clean and gently exfoliate at the same time. If you wear a lot of eye make up you might want to wipe with away with damp cotton wool pads to prevent your muslins getting too grubby, but it's not essential. The perfect finishing touch is a refreshing splash of cool water before you apply your toner (if you use one) and moisturiser. Cleanse properly every evening before bed and your skin with thank you with a healthy radiant glow. Enjoy.